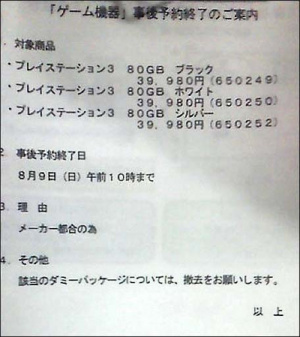 If You Could Read Japanese You'd Know This Documents States The End Of The 80GB In Japan. The 80GB? Soon to join them. Japanese retailer 7-Eleven are stating that orders for the black and white 80GBs will cease this coming Sunday, August 9th. The reasoning? "Manufacturer's request". The notice even states that all marketing for the 80GB is to be taken down from the stores. Now, Japan could be making way for the yet-to-be-released 160GB Playstation 3, but the timing seems to suggest that the Playstation 3 Slim is now imminent. Hold onto your hats folks.